Windows Phone 8 and a 41MP camera up against the best-selling Android. How does Nokia’s Lumia 1020 – a cameraphone on steroids – stack up against the current Android king? The latest handset from the Finnish Windows Phone 8 supporter packs an unbelievable 41MP sensor into a 4.5-inch smartphone, but can its other features compare with Samsung’s Galaxy S4 – the predicted global best-seller? The Nokia Lumia 1020 is the latest feature phone for Microsoft’s Windows Phone 8 operating system. It is a stunning piece of hardware, undoubtedly packing the most powerful pinhole camera to ever be bundled with a smartphone. But are the specs up to snuff for someone who wants a dedicated smartphone plus a really nice camera – or is it more suited for someone whose priorities are the other way around? The Nokia Lumia 1020 has a 4.5-inch AMOLED screen with a resolution of 1280 x 768p and 332 PPI. It is 5.13-inches tall, 2.81-inches wide, and 0.4 inches thick and weighs 0.34 pounds. It is offered in yellow, black, and white. Beneath the Lumia 1020’s polycarbonate shell is a dual-core, 1.5GHz Qualcomm Snapdragon S4 processor. It offers 2GB of RAM, 32GB of built-in storage and is powered by a 2000 mAh battery. Of course, the stock OS is Windows Phone 8. The Samsung Galaxy S4 comes with a 5-inch Super AMOLED HD screen with an exceptional 1920 x 1080p resolution at 441 PPI. As for its size, the Galaxy S4 measures 5.38-inches tall, 2.75-inches wide, and 0.31-inches thick – making it narrower and skinnier than the Lumia 1020 even though it has a bigger, more powerful display. The Galaxy S4 is also lighter, at 0.29 pounds. Inside the Galaxy S4’s (often criticized) plastic exterior is a Qualcomm Snapdragon 600 CPU, with four cores rated at 1.9GHz. This is an obvious step above the Lumia 1020’s S4 chip. Samsung’s premier handset also has 2GB of RAM and, depending on region, comes with 16, 32, or 64GB of internal storage – plus a microSD slot that accepts cards up to 64GB. 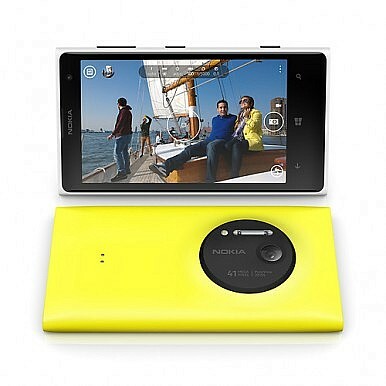 The Lumia 1020 utilizes a unibody design, without an external memory card slot. This also means that the battery cannot be replaced. The Galaxy S4 has a larger 2600 mAh battery that can be removed. The Samsung Galaxy S4 comes stocked with a TouchWiz-skinned version of Android 4.2.2 Jelly Bean. The Android-supported Google Play store offers more than 800,000 apps, while the Windows Marketplace has fewer than 150,000. As “just a smartphone,” the Galaxy S4 packs more premium specs than the Lumia 1020. In fact, it wouldn’t be much of a stretch to call the Lumia 1020 a “mid-range” device – but only if we leave out its stunning camera, hands-down the most important part for potential consumers. The Nokia Lumia 1020’s 41MP PureView sensor trumps the competition in photo tests. It takes larger, more color-accurate, and less-noisy photos than any other currently-available handset. Zooming past 200 percent can be done without any noticeable pixelation. The Samsung Galaxy S4’s 13MP sensor, while more than enough for average users, cannot compete with the photography-focused Lumia 1020. However, the camera is so prominent on the Lumia 1020 that it cannot lie flat when placed on its back. Are you a photographer who needs a decent-enough smartphone that can double as a proper high-res shooter? Are you a power-user who only takes the occasional photo? Then the choice between the Lumia 1020 and the Galaxy S4 should be clear. But if you fall somewhere between the two extremes, you will probably have to settle with the device that offers the user interface that you feel most comfortable with. The bottom line is that the Lumia 1020 is a more-than-adequate smartphone and the Galaxy S4 has a totally competent camera. You can’t go wrong with either of these flagship handsets.